You return home after a grueling day at work. You walk into the door to an enthusiastic greeting like only those that live with a dog know. His tail is flailing about like a helicopter on steroids from the simple joy of seeing you. You’re home, you’re home, YOU’RE HOME! You will never have another being in your life quite this happy to see you upon every single return. Your dog has been cooped up in the house all day while you’re out earning wages for more biscuits. You: exhausted. Dog: day has just begun – you’re home at last. You grab the leash as your ever more exuberant pooch struggles to contain his enthusiasm. As the door opens, the air surges in carrying the magnificent aroma of the great outdoors. Fido rears forward in pure delight. You brace yourself firming your grip on the leash as your dog’s body is bursting with joy. While walking your dog can be a joy, all too often it feels just painful or frustrating. You see this walk as another task to get done. Your dog sees this walk as his chance to explore the world he loves. You struggle to keep him under control. No sniffing! We must walk to get the job done of getting out his energy. No going out ahead! We must maintain composure. We certainly do not want our dog to be the leader or run the show…or do we? What if, for this moment in our task-filled busy lives, we did let our dog lead us? Just MAYBE this walk could be for the joy of both you and your dog. You see, dogs do not need meditation or to strike yoga poses to bring them to the present moment. If you allow your dog, he is capable of bringing you to the present moment right along with him. But, in order to do so, you must allow him to take the lead. We humans take in most of the world through our eyes. At least when we’re able to quiet our minds enough to actually SEE what is right there in front of us. Dogs take in the world around them through their noses. They do not have the language skills to get caught up in the chatter of thoughts swirling through their heads. Lucky them! In order to follow, you must be present. When you follow, another can open up the world to be seen in a way you’ve never seen before. The leader becomes our teacher and if your desire is to learn, you must be present. If we follow rather than lead our dog, we allow another dimension to enter our lives. Our dog’s noses are at least a 10,000 times more powerful than ours. That nose perceives things you will likely never see on your own. My dog has led me to discover flowers I had never before seen. My dog has led me to see hidden creatures, I would never have had the pleasure in meeting. My dog has led me to things that have broadened the world I experience each and every day. Stop and let your dog sniff. It’s not the distance that’s all important, it’s the experience and stimulation that count. Let your dog lead you to explore the world in a way only your dog can. The dogs in my life have taught me much. They have opened doors to seeing the world through eyes only they could open for me. Great joy can come from being present and exploring the world through their eyes or noses. The world, if just for a short time can exist free from human judgment. Of course, we still must guide them too, as safety for either of us does not appear to be top of mind for them. If your enthusiastic dog is a serious puller, it can be exhausting and you want to get to a place where you’re both in tune so you can relax and enjoy the adventure. You can learn the technique and practice that. But outside of those times when we must wrangle to navigate the world we live in, it can be a joy to let your dog lead the way. A walk isn’t a military parade or struggle for mastery. Let your dog lead and see your world expand. P.P.S. Don’t miss our local services in Minneapolis, Minnetonka & Edina, MN areas providing In Home Puppy & Dog Training and Puppy Classes in South Minneapolis, MN for raising a Go Anywhere Dog™. Do you have a new puppy or adopted dog? Would you like to learn more to help your social dog enjoy a social lifestyle? 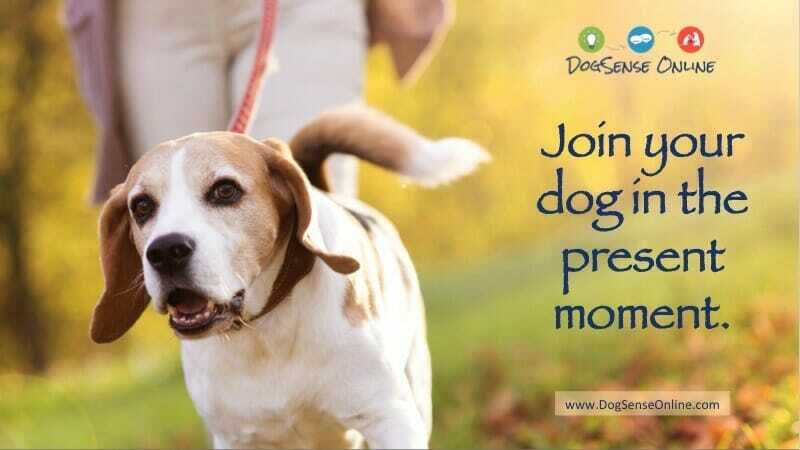 Get your DogSense & enjoy your dog! It’s more than your usual dog training class. It’s a learn-at-home & at-your-pace online dog behavior & training program. All specifically designed with you and your social family dog in mind.